I got heartily sick of gels during the bike ride at Ironman UK 70.3, so it's time to experiment with food options for the full distance Ironman. Gels on the run are fine - it's pretty hard to eat anything else while running, and harder to digest as my effort level will likely be higher on the run than bike (less blood flow to the stomach). There are plenty of options out there - but I don't have much time to prepare ahead of tomorrow's session, so it's got to be quick and easy. I need 60g carbohydrate per hour to keep me going over long distance. Tomorrow I've planned an 80km bike ride and a 20km run - at training pace that should all take about 5 hours. On the bike I'll take 2 bagels each with 30g of Nutella in (yum) plus a 500ml bottle with one sachet of High5 powder in. High5 to be sipped throughout the ride, and a quarter of a bagel to eat every 15 minutes or so. I'll take water in the other bottle. Returning home for a quick transition, my run belt will be ready with another bottle with High5 powder in, and 4 gels - one as soon as I set off, and at each 30 mins afterwards. 284.4g of carbohydrate over 5 hours gives 56.9g per hour. This is a touch on the low side, I'd aim to be 10g per hour above this for a very long day, but should be enough to know if the bagels are OK.
To try and make sure I'm not "cheating" by having a big breakfast that would mask the effect of any under-fuelling I'm going to keep breakfast light. A cup of tea and a single piece of toast with no butter and 20g peanut butter should do the job. One difference between this experiment and race day would be I'd probably go with white bagels on race day to keep the fibre level down. It's important to train and test every aspect of the race - there's more to this lark than just swimming, biking, and running! Ironman 70.3 UK, Day four, Race day! Mrs has also prepared a race report, you can find that here. It's well known that no one gets any sleep the night before race day, I didn't expect to get quite this little though. We took the evening before quietly, ate early with Chris and my Dad before heading up to our room at about 7:30. We chilled out to some music and TV before turning in at about 10pm, at which point some seriously drunk people decided it would be fun to stand outside the pub (under our window) and shout and sing and make stupid noises at the tops of their voices until well gone midnight. In a dramatic case of role reversal, Mrs fell asleep instantly and didn't hear any of it, while I lay awake getting more and more annoyed. I used the time to visualise my race step by step. I managed to get right to the end, in what felt like real-time. I next awoke and saw the clock at 03:45 - hell, three and a half hours of sleep is enough for any man! We got up at 04:00 (arising before 4am is not permitted, that counts as "yesterday"). The last thing we did yesterday evening was to apply our temporary tattoos - they seem to have held well over night. The big difference between this race day and previous races is that most of the preparation is already done - bikes and bags were dropped off yesterday and we're already registered. There's nothing to do but get dressed, eat, and head off to the lake. I was feeling fairly calm - I'd spent a long time thinking about today and making sure everything was suitably planned. I remember volunteering in transition in the morning of the inaugural Wales Ironman race at Tenby last year, there were literally hundreds of panicking competitors desperate to get to their red and blue bags to check the contents, add something, remove something, and generally faff. They seemed very ill at ease, and very stressed. I was determined not to be one of those people. If you put what you need in your bags in advance, then it'll be there on the day. I'm fairly sure Ironman don't have special Iron Pixies who go and mess up all your bag contents for you. We drove across, clocking three or four race vehicles out to patrol the course on the way. Traffic was good - we got straight into the car park field with no delay. The Rotary Club team of car parking attendants had done a fantastic job all weekend, and were still on the ball today. Massive thanks to all of them. We heard some reports afterwards that the parking was a nightmare if you got there late - top-tip, get there early! Much less stress. We met up with Chris and my Dad ("You're starting at WHAT time?!") and killed time until the start. There was a 15 minute delay getting going, but eventually we walked down to the lake and swam out to the start. I was keen on having a good warm up, so was a bit disappointed that we were told we had to remain in the main village area until notified that we were to be walked down. To be honest, I didn't check the lake ahead of time so I don't know if warming up properly was an option. I did what I could with some high-knee running and arm-swings on the way down. I really wanted to get started now. There seemed to be some commotion about exactly where the start line was - some people seemed to be many tens of metres forward. From somewhere the national anthem rang out and many of the athletes sung along. Singing was not high on my to-do list, however, I was trying to gradually get my face wet with the cold water and focus on my start. As I've mentioned before I have freaked out a bit in open water starts previously and it takes a good few minutes for me to settle down. Finding a calm place to float and focus before starting was part of how I was aiming to combat that today. Suddenly, I heard someone shouting "Let's get on with it then!" (or something similar) and everyone was off. I didn't hear a klaxon, gunshot, air-horn or any kind of official starting noise - I don't know if there was one. I found that a bit odd. Anyway, best get on with it then! All the red hats set off (elites, ultimate athletes, and lower age groups - green hats were 15 minutes later, athletes in the 40+ age groups). I took some time to settle in to my stroke, and thankfully didn't get any of the discomfort I've had before. I don't know what was different this time - maybe I was more mentally prepared, or possibly it was because I had a good bit of clear water around me and didn't get into the jostling and shoving part until a few minutes in. I found some handy trees on the horizon to use as markers, and got into my rhythm. I quickly started overtaking people, and managed to stay on course in a good straight line - not much correction required. To say there were almost a thousand people starting in my wave it didn't feel that crowded. I suppose there's only so many people you can see when your head is in the water, and it's only the 5 or 6 in your immediate vicinity that you need to worry about. My stroke felt good and strong, thank you Jez Robinson, it seems that swim coaching is really starting to make a difference. The first buoy came quickly and I turned hard right with it banging my shoulder - no long turns and wasted time here. It took a while to sight the second buoy but once I did, and located another handy tree on the horizon to aim at, it quickly came up. I was feeling good and strong, and my stroke remained stable and controlled. Turning right again I found the exit gantry in the distance. 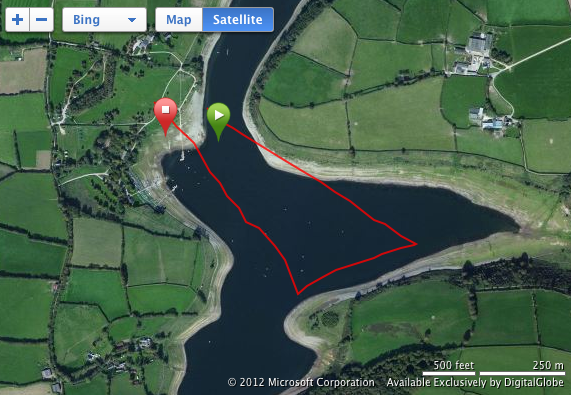 Here was where I made the only big mistake in the swim. I was still feeling strong, but my focus started to drift and I daydreamed a bit, thinking about all sorts of things. Losing concentration meant I didn't sight as often as I should have, and I started to go off course. I was yelled at by someone in a kayak - I couldn't hear what they were saying, but I heard the word "Yellow!" and realised there weren't any other swimmers around me. I'd drifted right and was going off course! I needed to make a sharp adjustment left in order to get back on track and go round the left side of the yellow interim marker buoys - going on the right side is off-course, and a fast track to DSQ (DiSQualified!). 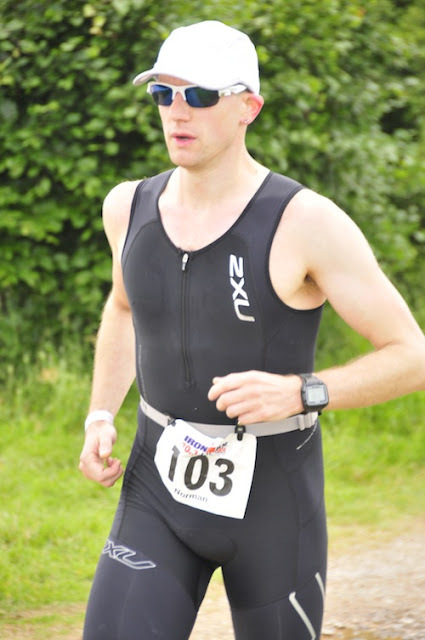 Exiting the swim - nice marks on my head from the swim cap! I stayed in the game for the rest of the swim, and didn't lose concentration again. Something to watch out for in the future. I'm really happy with this time - it's the fastest 1.9km I've ever completed, and about 5 minutes faster than I was expecting. In other triathlons I've been around the end of the top third (e.g. 30-33% down the field). I expected the standards to be higher here, so I'm not surprised I'm a little further down, but still comfortable in the top half and I didn't freak out at the start. A really good start to the day, and I smiled checking the time on my watch as I made my way to transition. Exiting the swim I jogged and quick-walked up the grassy hill to the transition tent conscious of not wanting to spike my heart rate unnecessarily. It was slippery and muddy, and the route went across a couple of paths with pointy stones (matting next time please, organisers). I'll be the first admit that my T1 was pretty poor. I found my bag very quickly (always make sure you take a moment to remember exactly where your bag is hung on the racks - in the heat of the moment the numbering doesn't make the most sense) and then found a spot to sit down. I used my socks to wipe the mud, gravel, and other bits of lake off my feet - a few seconds wisely spent here could save hours of cycling discomfort or a silly avoidable injury. Socks and cycling shoes on, no problem. Next up, my arm warmers. It was a nice day and shaping up to be warm, but I'd heard so many times that arm warmers were essential on the long bike legs that I'd been determined to wear them. Normally I can slip them on in a few seconds, but I'd never tried it with wet arms - and they stuck like glue. I wrestled with them for too long, and also found it tough getting the left one on over my chunky Garmin Forerunner 910XT watch. Wasting time now! I had also decided to wear glove liners under my cycling mitts, and to slip them both on together. This also failed with wet hands and I had to separate the gloves, and put them on individually. 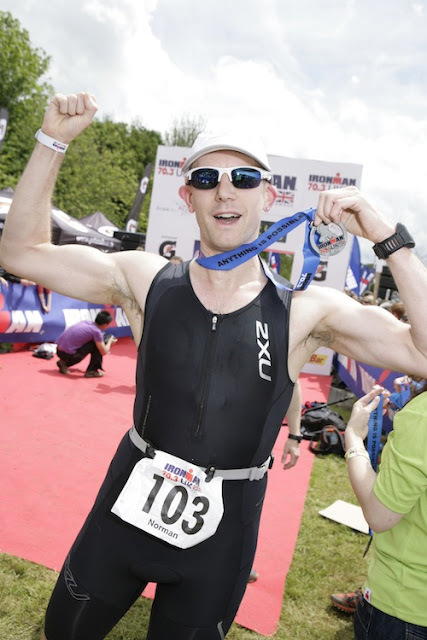 Bit of a farce - I shouldn't have bothered with any of it, and just gone out with bare arms and hands, like in every other triathlon I've done recently. I could have kept my arm warmers in a pocket, or on my tri bars, and just put them on if I got cold out on the road. I'm reminded of the first Thames Turbo sprint triathlon I did in spring 2010. I took what felt like about a week in T1, getting dry, putting on socks, gloves, etc, and a cycling t-shirt. All unnecessary, and all chewing through vital minutes. It seems in this new scenario I need to learn some of those lessons again. It's important to be settled before you go out on the next leg, be it bike or run, as you'll be doing it for a long time in a full or half Ironman race and a twisted sock or forgotten nutrition could make or break your day, but I think I need to try and do it a bit quicker! I finally got out of T1 and ran through the mud to my bike, hoping that my shoes would still clip in properly when caked in wet mud. They did. Now, time for my strong section, the bike. 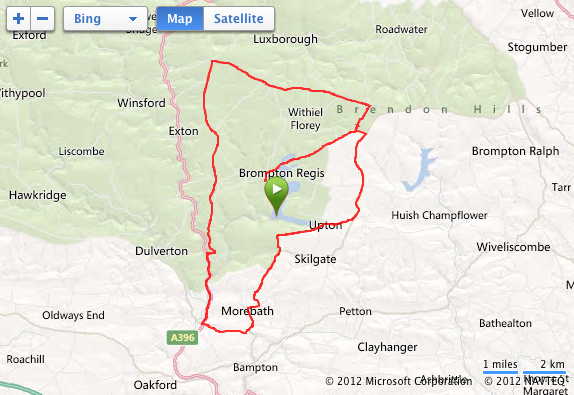 90km (56 miles) of undulating terrain with a few steep hills and some technical descents. I ran over the mount-dismount line, and hopped onto the bike pleased I'd taken the decision to have my shoes in my bike bag rather than attached to the bike, otherwise my feet would have been caked in mud. I left with a group of riders, and we took it gently down the 2-300m of narrow muddy lane to get out onto the road (a slightly wider and slightly less muddy lane). The advice is to start slowly - keep your cadence up, and just ride up the first long hill out of transition - get relaxed and comfortable, and be ready to wind it up as you settle in. I always have a heart rate spike when I get on the bike after swimming - this was reduced as I had spent so long sat around in transition, but I still wanted to get down under my threshold HR as soon as I could (threshold is the HR you can sustain for a long period, if you're above threshold, you'll burn out quickly). Within the first kilometre I needed to change off the big chainring - the chain jumped and then my pedals spun around with almost no resistance! It felt like the chain had come off (I looked down, it hadn't) or the hub had somehow broken and I was turning the cassette but not the wheel. Whatever it was I'd lost all drive and had no alternative but to get off quickly, unclipping my shoes before I toppled over. I'd left with a group of others so I had to get out of their way too, I ran over to the far right of the road, out of the way, to find out what had happened. Somehow, the chain was sat around the small chainring, but was not engaged - as this meant the radius of the chain was higher than that of the chainring, it never was going to magically engage, and so the chainring just span round inside it - I have never, ever, seen that happen before, in who knows how many thousands of miles I've cycled in my life. I manually mounted the chain back on the ring (at least it was a quick fix) and set off up the hill (these things always happen at the bottom of hills). Making some progress in my nice warm socks! Trying to put the weird behaviour behind me I found a nice low gear and trundled up the hill, overtaking lots of people along the way. I was amazed at how many people had mechanical problems - crunching gears, swearing, people getting off - hadn't they checked their bikes? I reminded myself that I too was one of those people. In racing there tend to be those who enjoy leading form the front, and those who enjoy chasing people down. I'm one of the latter. I love seeing people on the horizon and gradually drawing them in. For the next 10 miles, that's exactly what I did. Tucked down on my tri-bars, managing my effort carefully, and overtaking dozens of people. Their swims and transitions must have put me to shame, but I could sure as hell ride faster! 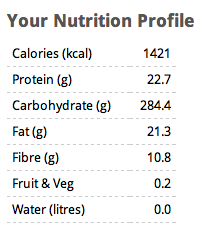 This is more like it - mechanical problem behind me, bike functioning well, nutrition on plan, and feeling strong. There is one particularly fast descent on the bike course, about a third of the way round. It's long and roughly straight, with a 100 degree hairpin right-hander at the end, followed by another steeper straight section down to a difficult junction and a 120 degree left-hander. This is considered so dangerous, it's marked as a "No overtaking zone", and was specifically called out during the race briefing in addition to having a large yellow sign placed at the top. It was on this descent that my second mechanical problem surfaced. I am not the most confident cyclist descending at speed on my tri-bars, so I was up on the risers and braking occasionally to control my speed. As I neared the first sharp corner I slammed the anchors on hard - at first I shaved a lot of speed off, decelerating smoothly and rapidly, and then from nowhere started to get vibrations up through the front end of the bike - these got worse and worse until I thought I was going to get thrown clean off! I couldn't see very well as my head was being vibrated. I'd slowed enough to make the first corner, and vibrated my way down the final stretch to the bottom corner. In honesty, I was really scared - if I couldn't stop there was no way of avoiding a crash, and at that speed it wouldn't be pretty. Full of adrenaline, I turned the bottom corner and gathered my thoughts to work out what had happened. In the stress, I hadn't changed down, so I was doing about 10km/h in top gear - as I changed down my chain jumped and skidded, failing to engage with the inner chainring again. I was going too slowly to take any action other than to get off, or fall off. I got off. At this point I could have cheerfully picked my bike up and hurled it over the hedge. Instead, I fixed the chain, manually shifted into a low gear, and got back on. Experimenting over the next couple of kilometres I found that whenever I braked at the front my bike vibrated like it was going to shake itself apart. It felt like the brake was being pumped on and off, exactly like braking on a warped rim - but with a carbon braking surface when the pads bite on the rim it's a very sudden braking effect - OK if you can apply it gradually to an even rim, but disastrous in this situation. I found myself on the hilliest 70.3 bike course in the world, unable to brake properly going down hill, and unable to change chainrings reliably. Well this was going to make for a fun next 40 miles. I was having quite a dark moment now. I had to remind myself that this was the first race of four, and the objective was to complete all four, therefore as long as I finish this race it doesn't really matter what the time is. I climbed the next steep hill (stopping to replace my chain once again) and crawled down the other side, back brake almost fully on - I was too scared to get up to a high speed when I couldn't see the road ahead, as I knew that if something unexpected happened I had no way of stopping quickly. It's a truly horrible feeling when you completely lose trust in your bike, and it means you just get slower and slower. I completed the first of the two laps and set off on the second, now starting to dread the repeat of the "No overtaking zone" hill. How could I control my descent? As it was I went down with both brakes on hard, the vibrations were so strong and really quite frightening, but I knew there was no alternative. Really, I should probably have stopped and withdrawn, but there was no way I was going to fail at the first hurdle in this journey. As I crept down the hill, other competitors flew past me (so much for no overtaking) - that in itself added to the scariness of the descent. I got down in one piece, and limped down the following hills too, trying to make what time I could on the flat and the ascents. I'd found a technique to jump my chain back on the big ring when it failed to change down, so I could at least manage that situation. With about 10 miles to go I noticed whilst freewheeling briefly I seemed to be losing quite a bit of speed. I realised that my front brake had been rubbing! So for 30 miles I'd been fighting my brake, as well as the hills. I reached down and adjusted the thumb-wheel - almost immediately my bike felt faster. Great! Couldn't descend quickly, couldn't change gear, and riding with the brake rubbing. What a terrible ride! At least I'd made it to the end though. I'm fairly sure all the people I overtook in the first 10 miles had now overtaken me back, and then some. I noted lots of fast people flying by me - they would have been in the second swim wave, so were 15 minutes ahead of me already. 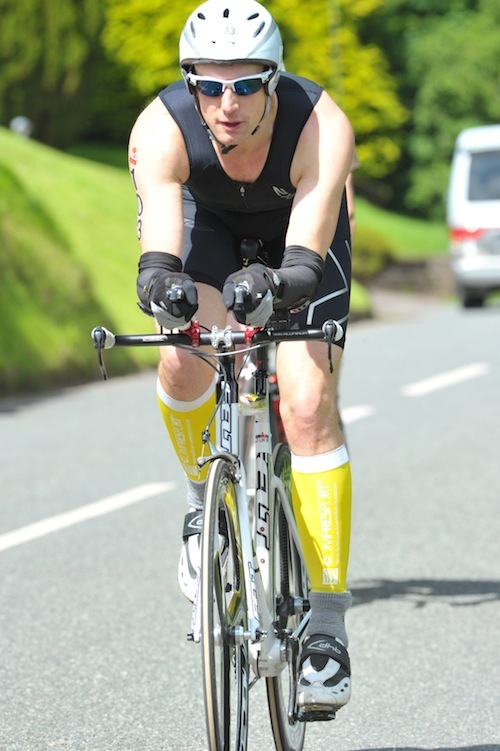 I tried not to get too dejected, reminding myself it was about getting to the end of Wales Ironman, I had to focus on that objective. I'd stayed spot-on with my nutrition with one gel 15 minutes in, then another at 30 minute intervals. I hadn't got tired (dejected, pissed off, disillusioned at times, yes, but not weak). This was a good result, and should have me in a good place for the tun. I know these times look good - into the top third overall - but remember I'm used to being in the top 5-10% on the bike leg of a triathlon. T2 was much quicker - I took advantage of the toilets on the way in, and did a quick change of shoes, shoving everything into my bag. One volunteer tried to help by emptying my bag as I was filling it, but apart form that the transition was uneventful. Arm warmers and gloves off, helmet off, cycle shoes off, run shoes on, cap on, and out the door. I had spare socks in the run bag but elected not to change, my Woolie Boolies were warm and dry, and the spares were only for if I'd got wet. I sploshed out of transition through the mud, and it was time to go for a run. One of the things I love about multi-sport is that you can segment the experience with clear boundaries even while you're still in the race. As soon as I started running the adventures and disappointments of the bike component were already forgotten. I had a new task, and its name was half-marathon. I've found before that after a long swim I've had what could only be described politely as a problem which is gaseous in nature. 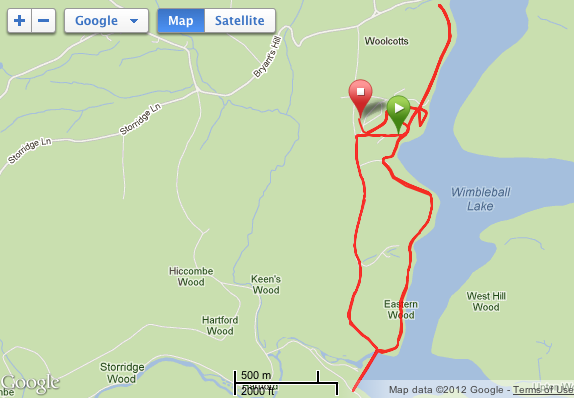 This kicked in hard in the first 5km and I farted my way round quite uncomfortably with some real distress in my guts. My posterior was so "vocal" that it proved to be quite the conversation starter, "As long as it's only gas, I don't mind!" I quipped to a few passers by. Thankfully it was only gas, and over the first 5-7km everything settled down and was able to speed up a bit. My plan was to continue with the gels every 30 minutes, but I really couldn't face one with my stomach as it was. I decided to swap to a half banana from the aid station I passed 30 minutes into the run, and that worked out well and made a nice change from the sweetness of the gels on the bike. I had already decided to walk up the one big hill on the run - overall it wouldn't make much difference to my time, and it would be much more useful to save that energy for where it made a difference. I stuck to this plan rigidly, and ran the rest of the way, only walking a few steps at the aid stations when I stopped to take some sips of water. I took on gels at 60 and 90 minutes in - my stomach had settled completely within the first 30-35 minutes, and I felt stronger and stronger. I took the first of the three laps deliberately slowly (regardless of the stomach distress I had planned to start slowly and build up). I felt stronger on lap two, but still held a bit back in the knowledge that I had a third to complete. For the third lap I pushed harder, I think there was more to give but I had nothing to prove at this stage - I knew I could finish well and in one piece, and that means it would be mission achieved successfully. My Dad was out on the run course and I saw him a few times. I got encouragement every time I saw him - I hadn't appreciated the strength you get from support, it was a real boost and I'm so pleased he made the long trip down to support me. I'm looking forward to having Chris' support in Bolton - I think we're going to need it! The course was tough and technical - slippery and muddy in places, slippery and grassy in others, and challenging throughout. A lot of climbing and descending, there were very few level periods. Apart from the few hundred metres over the dam and back, there wasn't really any flat. Wimbleball is famous for its hilly bike course, but I think comparatively the run course is harder (though that may be from my position as a more competent cyclist than runner). At the completion of the third lap I took the spur that led to the famous red carpet and finishing chute. A smile broke out onto my face completely outside my control, and I ran down looking good and strong, raising my arms in victory as I crossed the line. I'm very happy with the time - it's a minute faster than I ran the Nike Run To The Beat half marathon in with Mrs last year, and that was a walk (run) in the park compared to this course. I'm particularly pleased that my pace didn't decay, and I had enough left for a push at the very end. My GPS watch missed the first km or so, but to get an idea of pacing the first 10km it logged I ran in 62:31.9, and the second 10km in 62:17.9 - a negative split of 14 seconds. Doesn't get much better than that! So well inside the top half in my age category, and inside the top 40% out of all the finishers - not bad for my first go, a pretty solid day at the office. Eimear Mullan took care of the Female pro race with a finish in 4:53:33, pushing defending champion Emma-Kate Lidbury into second by 2 minutes and 50 seconds. A full set of results including the professionals and all age group finishers can be found in the official results PDF. Mrs came in with a time of 7:11:04 - 16th out of 34 in her age group, and 985th overall. She had a solid race and is as pleased as I am to get the first of our four races ticked off in good form, and with no injury or major problems. This is what it's all about - the finishers' medal - a weighty beast! After finishing you're shepherded through to the "Athletes' garden" which is actually a big sweaty tent where you can collapse a bit and get yourself together before going outside to hook up with friends and family. We had some recovery drinks provided, and water, as well as a lovely white bap full of fresh hog roast being prepared outside. It was lovely to eat solid food after living on mush all morning! At this point you can pick up your white bag and get changed. I'd forgotten to put the milk we bought into my white bag, so I had my My Protein Recovery XS with water, tastier than expected. Me and Mrs, looking a bit more matched than we'd ever planned! Me and my Dad - thanks for the support, Dad, it made a huge difference! After exchanging stories and stocking up on tea and a cookie (thanks Chris!) we went back to transition to retrieve our bikes and bags and store them in the car. 70.3 races are all over in one day, including the prize-giving ceremony and roll-down for places at the Ironman 70.3 World Championships in Las Vegas. Mrs and I saw the roll-down when we volunteered at IM Wales last year, it was an exciting time as competitors waited to see if they were going to get lucky. I was keen to hang around and watch it this year too. 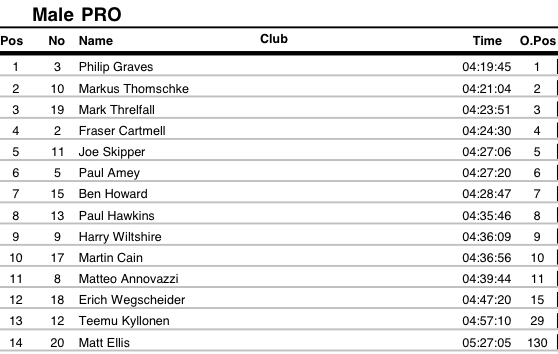 If you finish at the top of your age category you qualify for a place at the World Championships. If you don't want to go, the spot "rolls down" to the next fastest person, and so on. Some slots roll down well beyond the tenth fastest so it's worth hanging around - you never know what might happen! We also stayed for the prize giving for the professional athletes. Next stop was back home for some serious dessert. Very well earned, I think! Incredible freshly made Blueberry and White Chocolate Cheesecake! Upon reflection I'm really very happy with the way the day turned out. We'd been thinking about the day for a long time, and most things had gone according to plan. 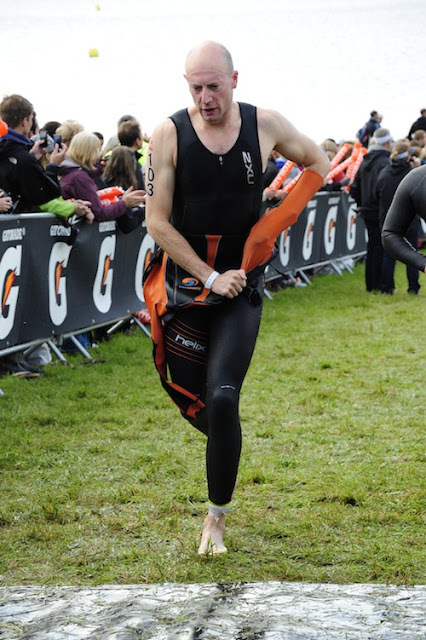 I learned a lot to take forward to my next races, and am now really looking forward to getting stuck back into a good block of training ahead of a taper for Bolton - our first full distance Ironman event in just 5 weeks' time. Taking it easy is the order of the day today. We went for a very light 15 minute run before breakfast just to get the legs turning over (not that they forget, but it's a good idea), and then crashed out for the morning with magazines and TV. Light lunch at mid-day and then the bikes went into the car and we headed off to Wimbleball Lake to rack them up and drop off our bags. We hooked up with long time friend Chris, and also said hi to Chris Tyrrell who we got to know whilst volunteering at Wales Ironman last year. He runs transition at the UK Ironman events and what looks like a tough but fun job coordinating all the volunteers. The site was getting very muddy (time to add wellies to the Big List of Stuff) but I managed to keep most of it off my bike. Having such a low number makes it dead easy to find our bikes - right on the back row, right in the middle. Similarly, our red and blue bags are easy to find, right not he side, top row, smack bang in the middle. That should help take some of the stress out of tomorrow. We left our bikes to get rained on outside while we went back to the pub for an early evening meal and relaxing night. 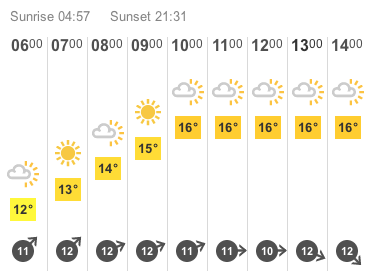 The weather forecast is for a more relaxed day tomorrow, brighter, milder, and most importantly less windy and rainy. All the fun starts bright and early tomorrow - up at 4am and out by 5, ready to get started at 7. I'm very very excited and really looking forward to getting underway. It will be a fantastic feeling to say we're "one down with three to go", and to finally get my mitts onto of those Ironman finishers medals. Today we had a few things to do, but as we'd driven down so early we had plenty of time to get them done in. Athlete registration opened at 10am so we had some breakfast and set off. The instructions said to avoid the tiny hamlet of Brompton Regis because it's too small to handle much traffic, so we carefully plotted a route that went down ridiculously tiny roads with very few passing places (no problem if your car is small and manoeuvrable, like mine isn't) and ended up taking us straight through Brompton Regis. Nil points for route planning. It's only 7-10 miles from where we're staying to Wimbleball lake, depending which of the dozen twisty routes you take - over the course of the day we optimised and now have a nice fast route on main roads with the barest minimum of head-on collisions. We got there at just before 10 and went to register. The "Expo" (grand name for a few tents) was still being assembled, and there was hardly anyone around. The "Expo", still being assembled - there's no-one here yet! 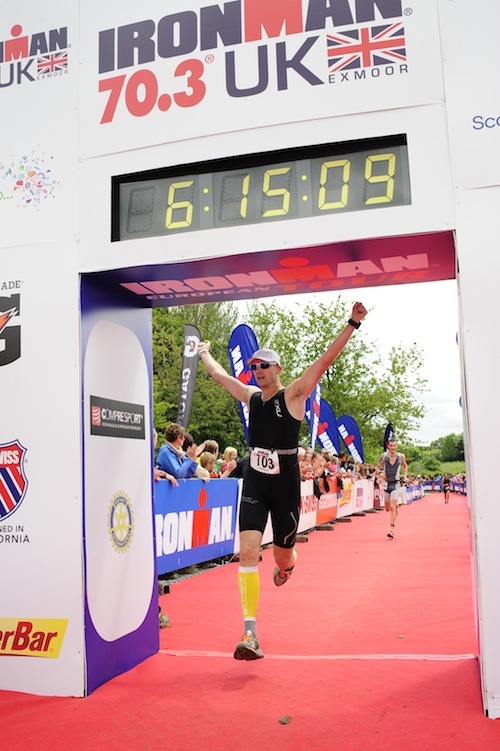 This is the only time I'll ever see a 70.3 finishing gantry with a time starting with "4 hours"! We got our ID bands attached, these would have to remain on until after the race, and collected our registration packs containing a hard copy of the race programme, numbers, swim hat (thick, red), and the all-important timing chip (left ankle, so it can't foul your chainrings on the bike). The last table was giving out transfers (number on right arm, age category identifier on back of right leg). Wristband ID being attached - smiles all round! The registration team were still clearly very new at their tasks (no mistakes, just not particularly optimised) and so I estimate we were two of the first half dozen athletes to register. It was a nice experience being there so early. We wandered around unimpeded and had time to take a good look at transition, the lake, the various routes we would be taking. A technique to ease the pressure on race day is to visualise the route you take and what you'll be doing at each point, and this relaxed time to survey the layout is very useful. We had a long chat with Peter from Totally Bikes about bike hire and kit and all manner of things. I was particularly impressed by the Vision Metron bar end shifters on this Felt DA, at first I thought they were little secondary brake levers. Squeeze the lever to change up one way, click the end to go down - beautiful, and much less movement/balance required than with conventional bar end shifters. Might have to look at those for a potential upgrade. The rain came in while we were down by the lake, so we scuttled off back to the car in search of somewhere to go and buy some snacks. We decided to go down to Dulverton, the bigger village just down the road from Exebridge where we were based. We hid from the showers in Lewis's Tearooms, where I had an unexpectedly wonderful salmon and noodle lunch - perfectly teriyaki, soy, and miring flavours. I was due to speak to my coach at 14:40 so we hung around and then huddled in a phone box for 20 minutes (is there really absolutely no phone reception anywhere around here?). Next job was bike assembly. They'd been sat in the car since we got here. There was a minor problem in that one of my brake levers had come loose, and the only way to tighten it is to take out the brake cable inner, re-seat and tighten it, then re-thread. Thankfully I had new cable cutters and all the tools I needed (see big list of stuff I brought). To be honest, when I looked at the list yesterday I thought I'd gone a bit over the top with precautions, but now I feel vindicated - score one point for preparation and not needing to roam around trying to find a bike shop in the middle of nowhere. Bikes assembled, and one quick test-ride later, and it was back to the lake for a swim. The water was cold, damn cold, but thankfully not as icy as at the familiarisation day. It was well under 10C on that day (6-8C estimated) but a positively balmy 14C at the moment. Whilst cold, you don't get the wind knocked out of you, and it feels easier to manage the naturally occurring cold-water reflex. A good confidence boost as I didn't freak out, and was able to swim properly after 6 or 7 minutes of warming up. As long as I get a chance to warm up on race day, I should be fine. Back to base for dinner and getting everything ready for our race bags. The blue BIKE bag has everything you need in T1, the red RUN bag s everything for T2, and the white SWIM bag os for putting things in right at the start, then you get it back right at the end, so use it to store anything you'll need straight after finishing (recovery drink, warm clothes, etc). The bags have to get dropped off the day before the race in transition along with your bike, and there's (theoretically) no access to them on race morning - therefore careful preparation is required. Blue bag: Bike helmet, warm socks, cycling shoes, gloves, arm warmers (prepared for it to be chilly out, can always roll them down if it's warm), sunglasses, race number attached to race belt, inhaler (shouldn't need it, but it's better to be safe, and psychologically I'm less likely to experience difficulty breathing if I know it's near). Red bag: Well used run shoes (I don't care if they get trashed in the mud, it's going to be a very messy course I think), run hat, spare socks (lovely if my bike ones have proven too hot, or have got wet) and another inhaler (I'm not planning on cycling with the one from the blue bag, and I won't have blu bag access again until after the race, so this is another safety net). I'm planning on being self-sufficient on the ride. 2x 750ml drinks bottles and 7x gels. I shouldn't need to stop at any aid stations, this will save me a lot of time (I can imagine it gets very crowded around them) and will remove one of the highest risk crash points - taking bottles, gels, and bars whilst cycling.